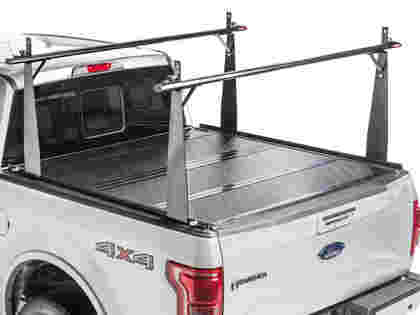 The BAKFlip Rack Integrated Series combines a hard folding tonneau cover with a cargo rack. This integration allows for full use of the entire truck bed with additional cargo capacity using the over the bed rack system. The rack uprights are designed to slide up and down the length of your truck rails, for optimum load handling and cargo control, while the hard folding truck bed cover designed to keep your cargo secure at the same time. 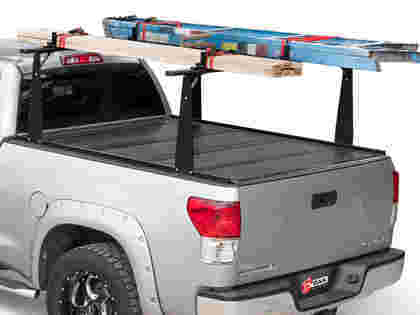 Whether you are hauling a kayak or conduit, a canoe, skis or lumber, look no further than the BakFlip CS rack system. Aluminum series with rack, the BAKFlip CS combines a truck rack system with the BAKFlip G2 cover. Premier rack and cover combo, the BAKFlip CS/F1 provides superior impact resistance, strength and durability with an integrated contractor rack system.